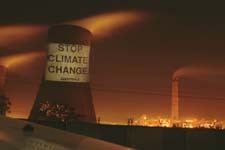 On March 28, Greenpeace activists beamed huge slides on to the cooling tower of the National Thermal Power Corporation Plant at Dadri, to spread a message on climate change. "Stop Climate Change-Energy (r)evolution now! ", read the slides. The giant coal-based power plant is located in Uttar Pradesh's Gautambudhnagar. It uses coal from the Piparwar mines in Jharkhand. According to Greenpeace, the beam-show was to make the centre rethink its energy strategy before climate change, driven by human activities, starts affecting the economic development of the country. "We demand a complete change in India's energy policy," says Ruchira Talukdar of Greenpeace. Ennore Thermal Power Station, Chennai, and the state-owned Raichur Thermal Power Plant in Karnataka also witnessed similar shows recently. "Fossil fuel burning is the major cause of climate change.India still burns coal which is the dirtiest fossil fuel," says Srinivas Krishnaswamy, an energy expert with Greenpeace. It calls on the centre to increase the share of renewable energy from the current level of 4 per cent to 60 per cent by 2050. The latest draft report of the Intergovernmental Panel on Climate Change has warned of grave impacts for developing countries including India. Greenpeace says it will release a blueprint for energy development in India soon.